The approval of 3GPP Release 15 New Radio (NR) specifications in December 2017 served as the official starting gun to the race for 5G. Since the first set of standards were ratified, component and chipset manufacturers, device makers, and mobile operators have been developing 5G NR products and services to be first to market. This is easier said than done, especially with respect to establishing efficient test methods. Even though 5G NR has roots in LTE, it poses many new design challenges for engineers. 5G networks will have more complex radio control protocols due to transmission interruptions to reduce latency, as well as millimeter-wave (mmWave) beamforming. Other design considerations include faster data transfer speeds, increased reliability, and more flexible network configurations. While verifying these physical layer specifications is challenge enough, engineers must do so while keeping test costs low and operating within extremely tight timelines. Signal analysis tools that can address these issues associated with 5G are necessary so engineers can efficiently and confidently release their products. Anritsu Company leveraged its experience and participation in standards bodies to develop signaling, protocol and RF measurement solutions for 5G NR product development and production. One solution is the Spectrum/Signal Analyzer MS2850A (Figure 1), which supports evaluation of TRx characteristics of 5G NR chipsets, communications modules, mobile devices, and other radio equipment. It is also well suited for researching new applications and base stations using 5G NR. At a low price point, the MS2850A offers much more advanced functionality than typically available in its class, helping to control cost-of-test associated with designing and manufacturing 5G NR products. It includes a built-in vector signal analyzer using wideband FFT (Fast Fourier Transform) analysis covering a frequency range of 9 kHz to 32 GHz/44.5 GHz with a maximum analysis bandwidth of 1 GHz. A high-speed, large capacity digitizer function coupled with optional modulation analysis function combine to offer a high-performance, multifunction, benchtop signal analyzer with excellent cost-performance ratio for both R&D and manufacturing applications. The MS2850A is the only analyzer in its price range with 1 GHz analysis bandwidth, so it can support wider bands for microwave and mmWave communications systems, not only 5G but broadcast satellites, as well. The MS2850A has the same or better dynamic range and amplitude/phase flatness as higher-end models, assuring both high precision signal analysis and product quality. A wider difference between DANL increase and input level at wideband signal measurement allows the MS2850A to achieve a more accurate EVM measured value compared to similar signal analyzers. The instrument also offers a one-button auto-range function that optimizes the complex built-in attenuator settings required for accurate EVM measurement. One key feature in the MS2850A is that up to eight carriers can be analyzed simultaneously as a batch to display the EVM and power for each resource block in the sub-frame section as a gradation. Since the power boosting applied to each resource block and the location of the degraded EVM caused by in-band interference can be monitored and compared visually for each carrier (Figure 2), this function plays a key role during R&D troubleshooting of chipsets and modules. The signal analyzer function in the MS2850A uses FFT to capture up to 24 seconds (at 100 MHz span) using a large 32GB memory. With this capability, the MS2850A supports spectrum displays, spectrogram displays, and applications where frequency and phase change with elapsed time. Digitized signal data can be analyzed with EDA tools for efficient R&D into next-generation standards prior to release of new standards, a key feature for development labs that will need to add test capability as new standards are released. In addition, a PCIe/USB3.0 option allows for high-speed transfer of large captured data (3s at 1 GHz analysis bandwidth) to an external PC to improve test efficiency by speeding data transfer times. 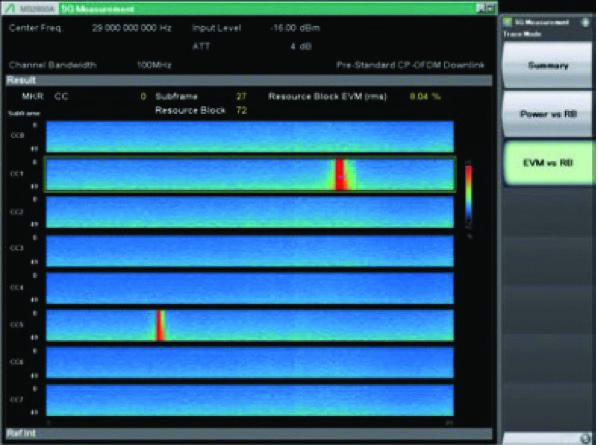 In addition, frequency bands required for 5G measurements are covered and all-in-one evaluation of multicarrier signals is supported by 5G measurement software. Five software packages are available, all of which are compliant with the 3GPP 5G NR standard. They can be installed to measure RF Tx characteristics of next-generation 5G base stations and mobile terminals, and create a test environment that can be easily expanded as needs evolve. The options include 5G Standard Measurement Software, NR TDD sub-6 GHz Downlink, NR TDD sub-6 GHz Uplink, NR TDD mmWave Downlink and NR TDD mmWave Uplink. These options, when combined with the MS2850A, provide an effective solution for fast and stable signal analysis measurements. Analysis can be performed on frequencies below 6 GHz and in the mmWave bands, such as 28 GHz and 39 GHz. Engineers developing 5G NR products need reliable, efficient test solutions that can help them maintain stringent product timelines and control cost-of-test. 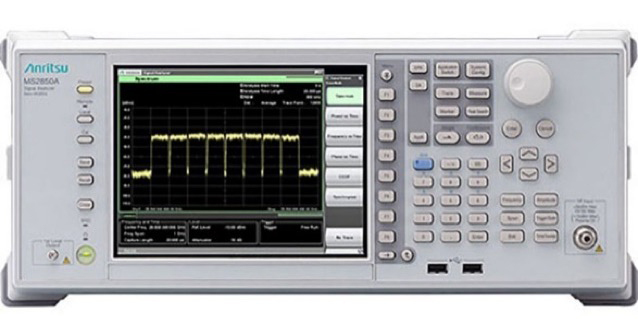 The Spectrum/Signal Analyzer MS2850A from Anritsu meets the current test needs in an easily expandable platform that can evolve as 5G standards continue to be updated.